Anyone else remember stained glass Jell-o jigglers from childhood? Here's my dogified version made with yummy yogurt, healthy gelatin, and colourful add-ins. Because I simply can't resist doing these crazy things. Haha! 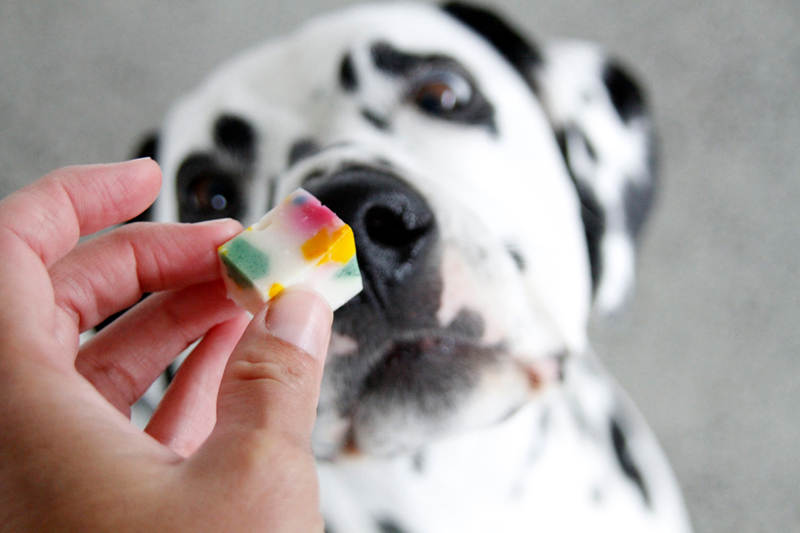 The dogs totally don't care about the colours, but they do love gummies! Like last week's pastel pupsicles, these are made using natural tints in a milky white base to create a variety of pastel shades for Easter. The same techniques can be applied to other colours for different holidays, events, etc. Swap the white for a clear gelatin base if you'd like the colours to be transparent and/or more vivid. My ongoing efforts at creating a natural blue-ish shade are still a work in progress, and I used a drop of blue colouring to perk up my blue. Just skip in favour of the other pastels it if you'd like to keep things all natural. Beginning with the coloured gelatin for the "glass" pieces, measure cold water/stock into a suitable pot/pan. Tip: I like using a pan instead of a pot when prepping gummies. More surface area makes for easier blooming. Sprinkle the surface with gelatin powder and let sit for approximately five minutes or longer for the gelatin powder to bloom/gel. Place your bloomed gelatin pan on the stove and gently stir the mixture over low heat until the gelatin is completely dissolved. Take care not to shortcut with high temperatures or overheat, as this can reduce the setting strength of your gelatin. Remove from heat. Check that your liquid temperature is below 50C (120F) to protect your probiotic content (allow to cool a little if needed) before adding yogurt. Tip: It helps to add the gelatin slowly to the yogurt, mixing incrementally as you go, to avoid lumping - especially if you have a thick yogurt. Divide the base into small containers and mixing in your different colourings/tints. 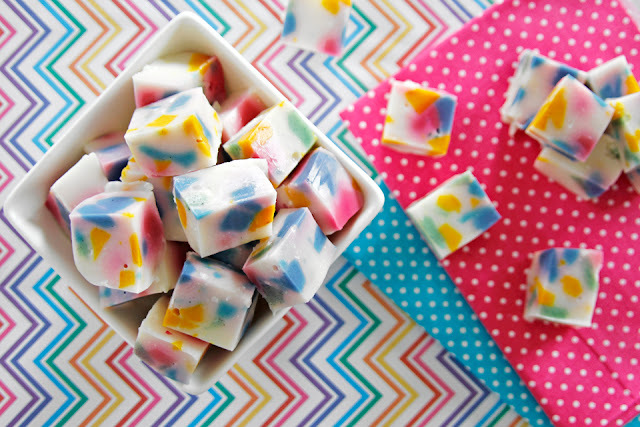 Tip: See our archives for more details on making multi-coloured/flavoured small batch gummy treats if needed. Once happy with your tinted mixes, refrigerate and allow the coloured gelatin mixtures to set thoroughly for several hours (or overnight). When ready to prepare the white gelatin for the surround, repeat the same prep as for the white base created for tinting. See above for detailed notes and tips. Measure cold water/stock into a suitable pot/pan. Sprinkle the surface with gelatin powder and let sit for approximately five minutes or longer for the gelatin powder to bloom/gel. Place your bloomed gelatin pan on the stove and gently stir the mixture over low heat until the gelatin is completely dissolved. Check temperature before mixing with yogurt. Allow the mixture to cool further to room temperature but it is still warm enough to be liquid. Tip: This is important, as warm gelatin will melt your "glass" pieces. When I first tried stained glass some time ago, I didn't let the covering liquid cool enough and ended up with a muddled rainbow swirl. Rather cool, really, but not the intention! While you are waiting for your white surround to cool, prepare the coloured "glass" pieces by cutting up your set coloured gelatin into pieces. Smallish pieces will allow a larger variety and distribution of colour, but don't go too tiny. Place in a suitable container and make sure the different colours are mixed about. Tip: Since the stained glass effect looks niftiest along cuts, I'm using a small deep container. and my finished gummies will be sliced half as thick, so there will be more visible cut glass in the finished treats. Pour the cooled white gelatin surround mixture into the container over the cut coloured glass pieces. Gentle tap or stir if/as needed to make sure that there are no air pockets trapped between the coloured pieces and that the coloured pieces are all covered into the white surround. Refrigerate to set thoroughly before slicing into bite-sized treats. Refrigerate the cut treats for storage, and enjoy in moderation. Remember to go natural or take care when shopping to avoid artificial sweeteners in ingredients like yogurt for your dogs – xylitol (also identified as sweetener E967) is particularly dangerous for dogs. If your dog is sensitive to dairy, you can use an alternative ingredient such as lactose-free milk or coconut milk to turn your base white. These are firm gummies. If you prefer, you can use less gelatin for a jigglier jelly treat. Individual gelatin powders may be a little stronger/weaker. Find a ratio that works for your preferences and, of course, your dog. Once set and cut, they are ready to eat, but for an even better "real" gummy texture/feel, after you have taken the treats out of the mold (or cut into pieces from your pan), return them to the refrigerator on a plate/tray uncovered to dry for a day before normal container storage. Colours may start to bleed slowly within the set treats, so these are best made and enjoyed fresh. These treats should be kept refrigerated and can be frozen for longer storage, although this can affect consistency. If gummies are frozen, I find that defrosting in the fridge uncovered on a plate or dishtowel helps to make sure that they thaw semi-dry instead of getting a little slippery. Freezing causes gelatin to separate which tends to bleed out some liquid content in addition to condensation factors. Multi-coloured gummy treats, like these, will likely have colour bleed into the surrounding shades/white as well.